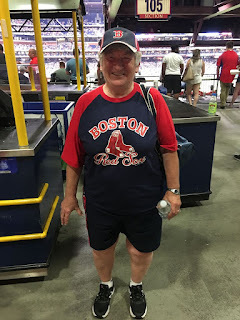 Red Sox Nation Invades Philadelphia...and Beyond! Hello my lovelies! I know I have been away for so very long and you have probably all missed me just as much as I have missed you. I must say it is great to be back and bringing you an article of this nature. Your's truly had the wonderful pleasure of being in Philadelphia for work this week. 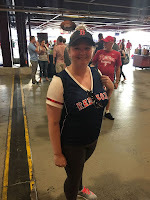 Ok, yeah, I know, on the surface that does not seem like much of a pleasure, but it worked out because our beloved Red Sox were in town and I had a chance to go to the game. It was almost as though they KNEW I was coming. Granted, it was a loss for the good guys, but it was nice to be a part of. 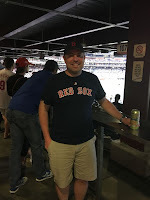 There was no shortage of Red Sox fans at the game tonight and for those of you who were live tweeting with me, you were able to hear the chants of "Let's Go Red Sox" and all of the applause for out beloved team. The same thing happened in Pittsburgh every time the Sox come to town. 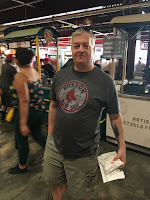 So, I thought it would be a nice change of pace to get to meet some of the displaced Red Sox fans here in Philadelphia and introduce you all to some of them. 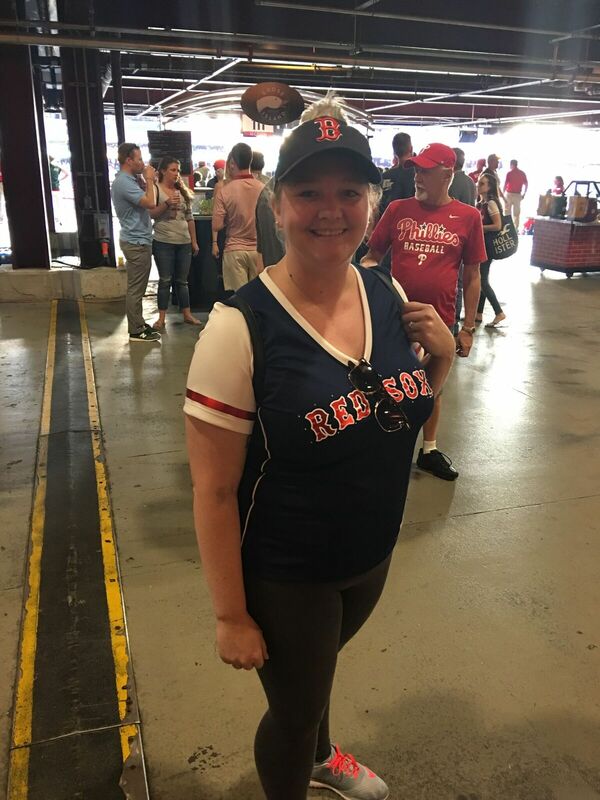 I ran into the first Red Sox shirt I saw which belonged to Steph Bender of Harrisburg, PA. 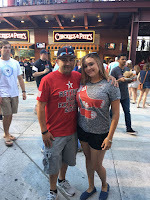 Although she looked at me like I was a weirdo and trying to pull a scam, she was gracious enough to talk with me and share her love of the Sox. Thanks so much, Steph! I hope you enjoyed the game! 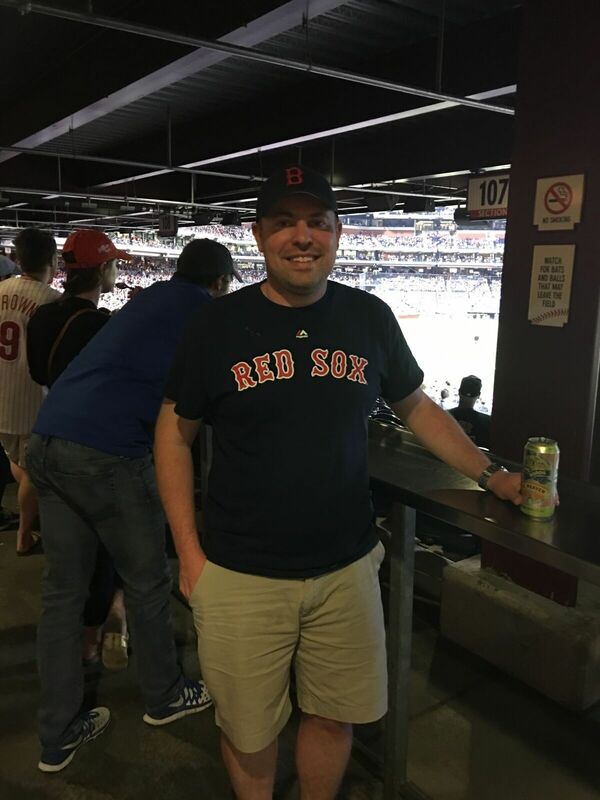 I was able to attend the game with my partner in crime, my brother from another mother, Jeff DeSantis (@jeffdesantis) who, despite some grumbling about Philadelphia traffic (which made us miss the first pitch, by the way) admitted that he did have a good time. Jeff, like me, is from Pittsburgh but has been a Sox and Bruins fan since he was little. When asked how be became a Sox fan his answer was simply, "Because of the Bruins growing up and I always liked Yaz." Diana and Bobby Lopez are originally from Texas but now call Philadelphia home. Bobby was in the beer line behind me, and as you can see, he is quite the Papi fan. I really enjoyed talking to him about the absence of the Large Father and I have to admit, was extremely jealous when he told me that he has tickets to Fenway next week for Ortiz's retirement ceremony. Bo-Town fans, show my man a good time! Enjoy the experience, Bobby and take pics for me! Derek from Clark Summit (outside Scranton, PA) informed me that there were two words that summarize why he is a Red Sox fan...Roger Clemens. That was it. That was all it took for him to be hooked. Sadly, he was at the game tonight with a friend who was a Phillies fan, and although the friend made attempts to get me to interview him, well, let's just say that I referred him to another site and kept on moving after a solid high-five from Derek. The highlight of my night had to be Rachel, Sophie, Lily, and Tessie Mammele along with Carly Iannone. 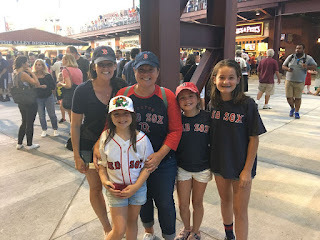 Aside from them being the only ones the entire night who knew what RedSoxLife was (and by default made me feel like less of a creep going up and talking to people), I have to say, that Rachel and Carly are raising the kids right! 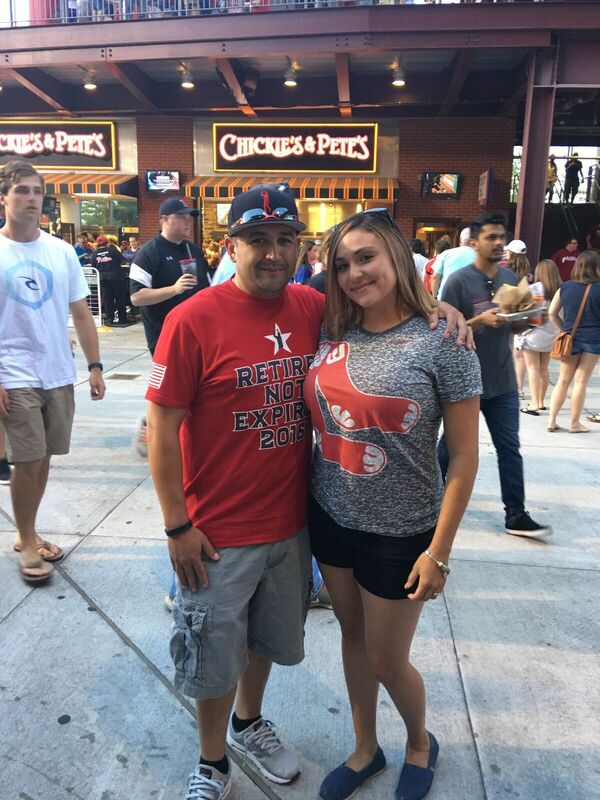 All were decked out in Sox gear and traveled to the game tonight from New Jersey. Carly shared that she went to college in Boston and recalled being able to hear games from her apartment. Rachel also mentioned that she had lived and worked in Boston for a time and that this was the root of their fandom. In true Red Sox Nation spirit, they are now passing that love onto their kids, who looked like they were having a blast! Last (but certainly not least) I ran into Terry. Terry is from Boston but now calls Philly home. When I started to ask her how she developed her love for the Sox, I stopped myself and we both realized that there was no reason necessary! Love the accent, Terry! Thank you! 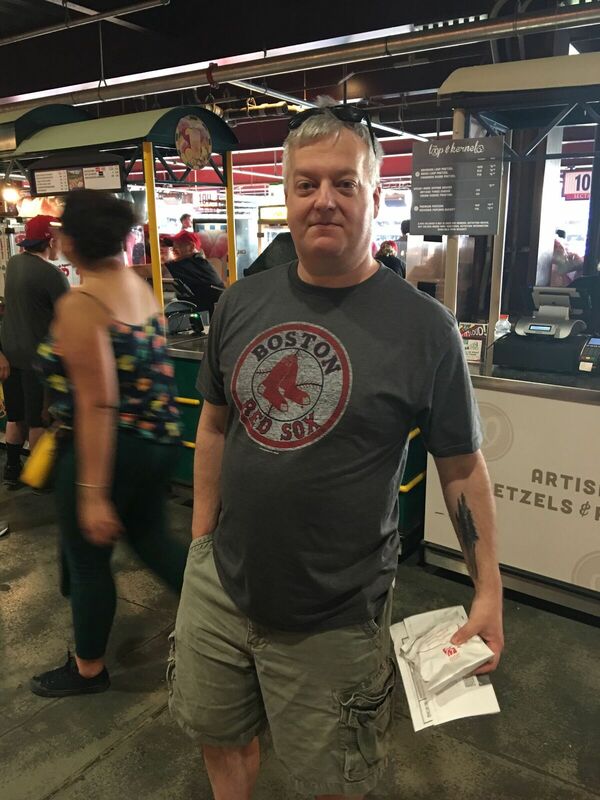 Every city I have ever been in, it seems that there has always been a larger showing of Sox fans than hometown fans and I always wondered why that was. I mean, I had my ideas and reasons why I thought it may be, but it turns out (after speaking to the amazing fans I ran into tonight) that it just simply is, and nothing more. And that is all that is needed. Love of the Red Sox is eternal. It knows no state lines, boundaries, or even has a reason sometimes, but in the end, we are all part of the same big lovefest and that is what makes Red Sox Nation the most unified and strong fanbase in the entire country. For me? Well, let's just say that I can thank my Southie grandfather for raising me right and insuring that I had that Southie heart and fight in me, and that I didn't turn into a Yinzer. Thanks, Pap. Love ya and Go Sox!